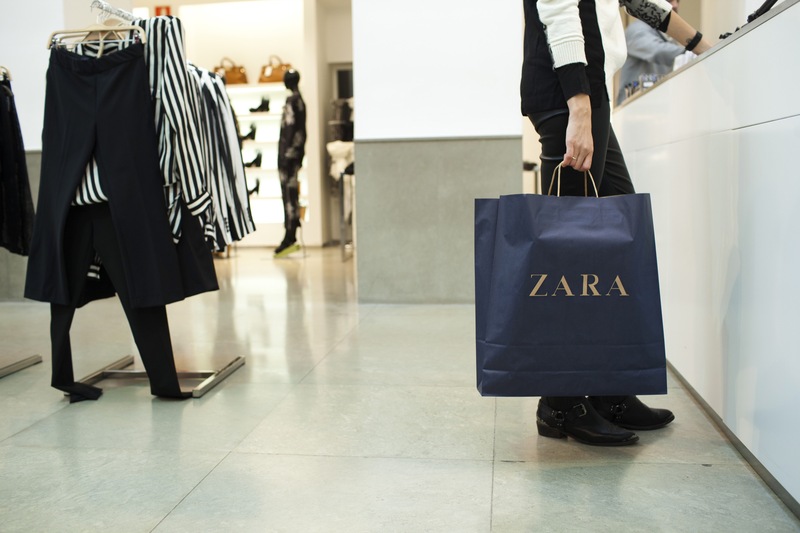 Inditex, the owner of the Zara fashion brand reported double-digit growth in online sales for last year. The company reported a 7 per cent rise in full-year net profits and sales up 9 per cent to €25.34bn compared with the same period last year. Inditex, who own retail chains such as Zara, Massimo Dutti and Pull & Bear, said that revenue from online grew 41 per cent over the year and that 10 per cent of total sales were now online. It was the first time the group has publicly announced online figures. I’m a huge Zara fan – the store is my favourite on the high street- but for the last number of years going into the store has become a painful experience both in Ireland and especially in the US. Staff struggle to keep up with the endless stock and size requests from customers, while fitting room and register queues zigzag through the store. Do I still go there? Yes. And the reason is that no other store on the high street has their finger on the fashion pulse like Zara. While their stock turnover is impressive, it does give way to huge logistical challenges when it comes to embracing the digital age. Inditex recently opened 19 new warehouses dedicated only to internet sales. And in order to keep up with changing stock , 1,500 new photos are put online twice a week to match the speed at which articles of clothing are delivered in store. “Online sales are becoming an element that is contributing significantly to the company’s growth,” said Pablo Isla, CEO of the Inditex group. In order to maximise their online platofeim Zara are gradually offering the possibility of next day or even same day delivery of online orders- as well as the possibility to easily pick up and return clothes to stores. These services may be crucial for customers but they represent a major logistics challenge, especially when faced with competitors like Amazon- which already has a much bigger logistics structure, already adapted to all sorts of different products. In 2016 Amazon was the top online clothes vendor. – it holds 11% of the global clothing market and this is expected to rise to 19% in 2020- according to data compiled by Bloomberg. One area which Zara are trying to apply disruptive technology to is the click and collect process. Zara customers really like ordering online from the fast-fashion chain before heading to a store to pick up their purchase — so much so that shoppers sometimes encounter waits when retrieving their goods. The retailer, seeing an opportunity to make its click-and-collect operation more efficient and less expensive, is turning to backroom robots. For Zara, robots will be a key element to reducing the backlog felt by customers in the stores. Not forgetting traditional in-store shoppers, Zara has announced that it will introduce augmented reality displays from April. Zara’s latest technological push shows models wearing selected looks from its ranges when a mobile phone is held up to a sensor within the store or designated shop windows, with customers able to click through to buy the clothes. Zara’s augmented reality displays will be introduced in 120 stores worldwide from April 18, Inditex said. Zara also opened a temporary concept store in London’s Westfield on Friday that will focus on click-and-collect services while its flagship is being revamped. The store is purpose-built for click-and-collect orders and will accommodate online purchases, returns and exchanges. It will be the first Zara store to offer a dedicated online section, and it will also carry a select range of women’s and men’s apparel. While its good to see the retailer embracing the new digital age. I’d still rather they hire more sales staff.